The opening week of this year's Chicago Architecture Biennial featured three architecture-related performances, which artistic directors Johnston Marklee included in the programme to highlight a trend for this mode of expression. A dance piece at the iconic Farnsworth House, a colourful collaboration between artist Nick Cave and architect Jeanne Gang, and a musical performance with costumes by New York studio SO-IL were all among the off-site projects presented at the 2017 biennial. This heavy focus on live movement-based projects that explored the body's relationship to buildings and spaces was deliberate according to Mark Lee, who co-curated the programme with partner Sharon Johnston. "Indeed this is intentional on our part," Lee told Dezeen. "Performance art is a medium of growing importance and brings to the biennial a time-based component that most traditional mediums could not." The inclusion of performances followed on from the inaugural edition, when architect Bryony Roberts conceived a choreographed routine executed by the South Shore Drill Team at one of Ludwig Mies van der Rohe's public spaces in the heart of the city. "In the first Chicago Biennial, Bryony Roberts did an incredible performance piece with a drill team at Mies' Federal Plaza," said Lee. "It was an indication to us that architects are beginning to look into this field that addresses the occupation of spaces." Johnston Marklee's theme for the biennial is Make New History, which asks architects to consider history in order to shape a direction for future architectural practice. Static exhibits include 15 alternative visions for the famous 1920s Tribune Tower competition. Read on for more information about the performances at the Chicago Architecture Biennial, which runs until 7 January 2018. Mies van der Rohe's Farnsworth House provided the setting for choreography duo Gerard & Kelly's third instalment of their Modern Living series, following chapters at the Schindler House by Rudolph Schindler in Los Angeles and the Glass House by Philip Johnson in Connecticut. The piece similarly explored how the modernist architecture influenced the unique relationships that the original occupant(s) had with the building, and each other, through interpretive dance. The house was designed for Doctor Edith Farnsworth as a retreat outside the city, for her to relax in and enjoy as a single woman. This fact, and the tempestuous relationship between the architect and client – also to be explored in an upcoming Hollywood movie – form the base for the almost hour-long routine. Two dancers – one male and one female – used exaggerated movements set to music while passing around the house. They rubbed up against the surfaces and materials, and interacted with each other at different points, as well as chanting. Observers were encouraged to move through the building and its grounds while the performance took place. "Events like this give us the opportunity to show that the Farnsworth House is a critical part of the architectural history of the United States, and the world, but it's not a precious object locked in time," said Farnsworth House executive director Maurice Parrish. 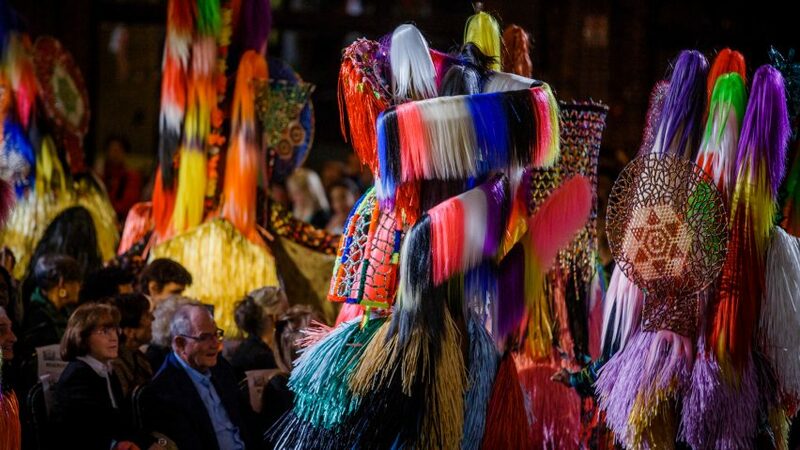 Known for his colourful Soundsuits, artist Nick Cave collaborated with Chicago architect Jeanne Gang on a performance that took place at the city's Navy Pier ballroom. The ritualistic performance involved extravagant beaded and fringed garments, worn by Cave and his performers while they moved through the audience, and navigated around hundreds of teetering chrome-coloured Mylar pillars contributed by Studio Gang. Set to music by composer Kahil El'Zabar, the show involved a period when the Soundsuit-adorned dancers were attended to by counterparts in white uniforms. Towards the end, Gang's pillars lining the front of the stage were set into motion, and audience members were able to interact with them once the performance ended. New York architecture firm SO-IL and artist Ana Prvački created a seven-minute piece performed by four musicians from the Chicago Sinfionetta in the city's historic Garfield Park Conservatory. Continuing SO-IL's exploration of material skins that filter the air, they created a set of costumes worn by the performers during the show as they walked slowly around one of the complex's vast greenhouses. Each white structural outfit was shaped to cater for the instruments used by the musicians – a trombone, a saxophone, a flute, and vocals – and covered the majority of the wearer. Worn using straps of the shoulders and around the waist, the costumes resembled scaled-down versions of a prototype house that SO-IL built for this year's Milan Design Week.